When Nintendo first announced the Switch, I had dreams that I would be able to turn it into a portable arcade: filled with pick-up-and-play games that you could easily share with a friend, ready for everything from 15-minute sessions on a bus to marathons on lazy afternoons. A year later and that dream has come true – my system has everything from Neo Geo fighting games to stock car racers, classic beat-em-up’s and rhythm games. 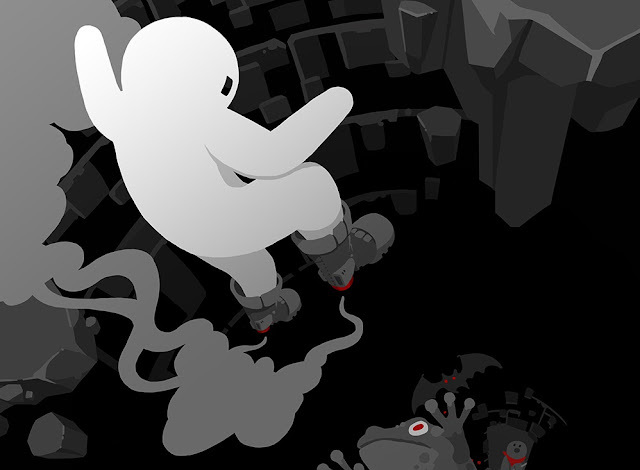 But for arcade-style enthusiasts like me, no collection is complete without Moppin’s Downwell, a frenetic platformer-roguelike hybrid about falling down a tunnel with guns tied to your feet. Downwell has been out for some time now on a variety of platforms, but if you haven’t seen it before, you play as a tiny figure falling down a procedurally generated vertical shaft filled with enemies. 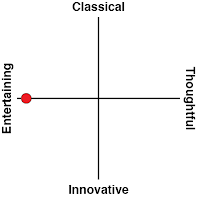 The game has been celebrated for its concise yet deep design, where every action has multiple purposes. Enemies can be dispatched by shooting them with your gunboots, but ammo is limited and you can only reload by landing on solid ground, or on an enemy’s head. There are powerups to be found inside tunnels, as well as shops that sell you lasting upgrades. At the end of each level you can also choose from a variety of perks which slightly affect your playstyle. The result is a game where no two runs are exactly alike – which is an impressive feat considering the average length of a run is about five minutes. The game’s simple three-button control scheme is easy to pick up and play, but there is a surprising amount of depth hidden in the mechanics too. 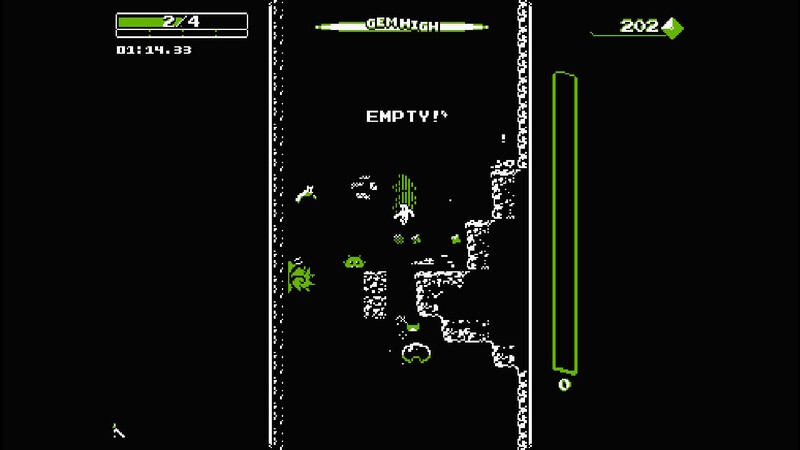 Downwell has two separate combo meters – a bonus for collecting gems at a constant rate (called “Gem High”) which buffs your weapon, and a combo based on killing multiple enemies in a row without touching the ground, which rewards you with gems and passive upgrades. 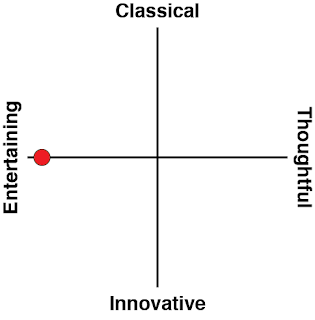 Both of these systems discourage caution and facilitate flashy gameplay with split-second decisions. As the player travels deeper down into the game’s zones, the enemies and traps will become more nefarious and will demand more skill from the player. I find that the meta of Downwell is all in its early two or three levels, where there is very little pressure from enemies and players are free to amass as many gems they can to spend on upgrades. There’s a large degree of planning involved in a successful run – both in the big macro decisions like which perk to take at the end of a level, or the smaller ones you’ll make across the course of a stage, like whether you want to trade your powerful shotgun boots for a weaker peashooter that comes with a health refill. The game’s minimalistic graphics and punchy sound effects lend themselves to incredibly legible gameplay – a person looking over your shoulder would be able to immediately figure out how to play, what the goal is, and how to get better. Enemies are colour-coded to show you if they can be jumped on or only shot from just a glance, and the game’s various colour options are sure to have something that is easy on the eyes. The sensation of playing Downwell feels just like Spelunky or Risk of Rain, but the average run is much shorter. I love that the game is full of natural risk-vs-reward decisions that will give you the same rushes of success and pangs of hubris that the roguelike genre is so well known for. There’s no persistent character progression either, so the further you fall in to Downwell’s stages, the more skilled you will need to be at the game. Persistent play will earn the player gems, however, which can unlock cosmetic changes and different playstyles. If there’s one downside to Downwell, it’s that it naturally becomes quite stale after around half an hour of continued play. This is natural – I can’t imagine any arcade-style game which wouldn’t grate after a while, so it’s a perfect fit on the Switch where players can squeeze in runs in between other games. The game will definitely catch your attention more effectively on a handheld like the Switch, Vita or tablet. The Switch version doesn’t come with any significant additional bells and whistles – it’s just a very solid port. The addition of HD rumble gives a little tactile feedback when you’re out of ammo or if you’ve taken damage, but otherwise there’s nothing too different about this version. Hilariously, on the Switch’s super wide screen, Downwell’s long vertical play area takes up less than a third of the screen’s width. The negative space can be filled up with a variety of backgrounds or cosmetics, or – if you can figure out a way to stand your console up on its side – you can play the game in the rotated Tate Mode which offers large sprites that fill the screen. The achievements from the console version are also present, but because the Switch lacks any macro framework compared to PS4 or Xbox One, you won’t be able to show off your achievements to your friends other than by taking manual screenshots of them, and naturally they don't contribute to a console-wide "score". 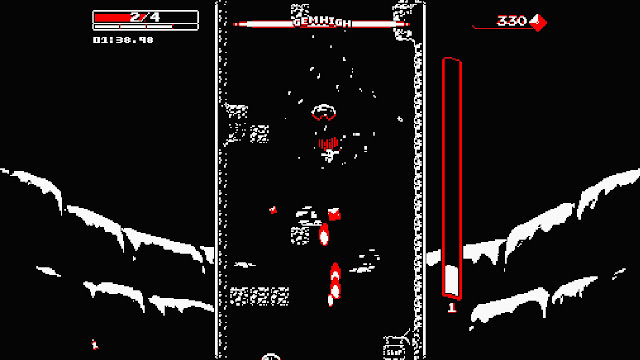 Downwell has always been the pet project of Japanese indie developer Ojiro “Moppen” Fumoto, who in 2014 decided to take up Rami Ismail’s challenge of making one small game a week. Once the core mechanics for Downwell materialised, however, Moppen realised he had struck gold – and the critical consensus agreed too. This game is a testament to the lasting resonance of a good idea – beneath its simple looking exterior lies an intricately deep game filled with true challenge. If you’re a fan of arcade-y action games and you haven’t tried Downwell yet, you owe it to yourself to pick it up – and the Switch is easily the best platform for it. I definitely don’t regret the download – even though my Switch is bloated full of titles, I can see myself always coming back to Downwell whenever I need to fill a short five to ten minutes.